Unseasonably warm conditions across Europe are being greeted with a mixture of disbelief and despair by those who normally rely on cold winters. James Cove and James Rodgers assess the winter weather. Ski resorts across the European Alps are becoming increasingly worried as current bad snow conditions threaten the all important Christmas holiday period. This autumn has been one of the worst on record with high temperatures and little snowfall. 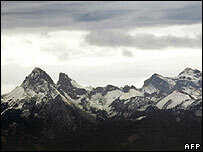 Many resorts have had to postpone their openings and the main ski races have been cancelled because of a lack of snow. With millions of skiers heading to the resorts over the next week there are concerns that the open runs will be very busy and people could be put off from booking again at Christmas and the New Year, costing the multi-million pound industry heavily in lost revenue, and threatening jobs. Many believe global warming is to blame for the lack of snow. The Organisation for Economic Co-operation and Development warned that many low-level resorts could soon be unviable and predicted warmer temperatures in the future. Already banks are refusing to offer loans to resorts under 1,500 metres as they fear for their future snow cover. Germany is threatened the most, followed by some Austrian and Italian resorts. However, the picture is not as bleak as some say, with the high resorts having good conditions on some runs. I am in the Swiss resort of Verbier and the open runs have good snow and more are set to open this weekend helped by artificial snow. 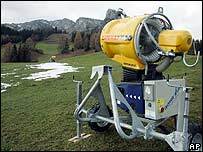 "We have many new snow-making cannons across our slopes and this has helped greatly," Pierre-Yves Deleze told the BBC. "Some snow is forecast to fall next week and then everything should be OK. If not though, it will make us more nervous for Christmas." The best skiing is to be found on the high resorts with glaciers: Tignes and Les Deux Alpes in France; Zermatt, Saas Fee and Verbier in Switzerland, and Obergurgl in Austria. The Ski Club of Great Britain advises people to head for these high resorts. "There is still some good skiing to be found around The Alps," said spokesperson Betony Garner. "It is not dire but you do have to head for the high resorts and expect that some of the runs will be crowded due to the lack of snow elsewhere." With poor snow in Andorra, a destination increasingly popular with British holiday-makers, the Pyrenees is not much of an option. In contrast, North America has had a very good start to the ski season with substantial snowfalls. "We have seen a big rise in bookings for the North American resorts with many more in the last few weeks," said Marion Telsnig from Crystal Holidays. But perhaps what the ski industry needs to do more than anything is to educate people not to expect such good skiing in December, but rather consider skiing later in the season as climate change affects the snowfall patterns. Nobody knows what to make of it. This is the middle of December in a country known for the severity of its winters. There's not a snowflake to be seen. Red Square should be covered in white by now. It's not. Its cobblestones are as stubbornly damp and grey as the skies overhead. There would normally be ice on the Moskva River. There's none. "It's just fantasy!" 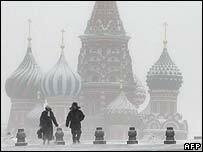 is the way the weather forecast began on one of Moscow's radio stations earlier this week. The announcer's voice betrayed a mixture of disbelief and despair. That's because Russians are proud of their cold winters. Some people welcome the fact that walking and driving the snowless streets and pavements is easier than slipping and sliding. Others, though, definitely feel that something is wrong. Temperatures for the last couple of weeks have been about five degrees above zero. At this time of year, five below zero would be more usual. It has been the warmest December since records began in 1879. Muscovites who are used to wrapping up against the bitter cold are walking around dressed as they normally would be in October. It is not just the people who are confused. Russia's wildlife is not sure what time of year it is. Hibernation has been put off. "The brown bears are half-asleep," says Natalia Istratova, a spokeswoman for Moscow Zoo. "They haven't gone into their dens yet." Snakes and other reptiles have yet to move to their winter quarters. Traditional winter pastimes of skiing and ice-fishing have had to wait. People selling thick woollen socks and mittens outside the Russian capital's metro stations are suffering a dramatic drop in trade. The weather is expected to get colder as the month goes on. It is strange to see Christmas and New Year decorations in the Russian capital when there's no snow on the ground. Mild, wet, weather on New Year's Eve might even dampen Russia's normally raucous celebrations.